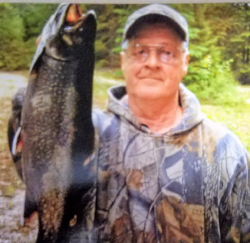 Gerald L. "Jerry" Norman Sr.
Leeds, ME - On the morning of Sunday December 3, 2017 Jerry passed away unexpectedly in his home in Leeds. Jerry loved hunting and fishing and the Dallas Cowboys! He enjoyed gardening, antiquing and wood working. He spent most of his time outside enjoying what nature has to offer. Jerry was one of the best Lisbon High school wrestlers in the 1970’s. He won state titles in 1971 and 1972. He was known around the state for his toughness on the mat. Jerry was predeceased by his mother, Theresa Norman, his father Gerald Arris, a sister Kathy Ringuette, and a brother Steven Arris. He is survived by his wife Gloria and her son Tim Wing as well as his oldest daughter Theresa Marstaller and her husband Kevin, his son Gerald Norman Jr and his wife Nicole and his youngest daughter Jenna Norman. Jerry also leaves his six grandchildren, Adam, Alex, Brittany, Brook, Elizabeth and Leo and was also blessed with two handsome great grandsons Axle James and Aydin Robert James. Jerry has many brothers, sisters, nieces, nephews, and cousins who loved him immensely. Life was a struggle for Jerry. He let many of his demons get the best of him at times. It was very hard for him to show how much he loved, but he did love with all his heart. We believe as a family that if he had any last words or wishes he would tell everyone that you can never show enough love for someone and it is ok to show it. Relatives and friends are invited to attend a celebration of life on Saturday, December 9, 2017 at1 p.m. at the First Parish Congregational Church, 461 Elmwood Road, Pownal. Followed by a gathering at the Slovack Club, 26 Avery Street, Lisbon Falls from 2 - 4 p.m.